Is it just me, or is everyone subjected to a difficult growth process immediately before achieving an amazing victory? 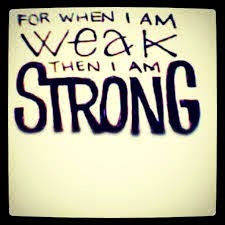 I routinely feel humbled, broken, and confused before my life is rebuilt at a remarkable level. In the meantime, it’s easy to question the purpose of trauma. The Bible suggests that a primary purpose of trauma is to allow God’s power to show through us. Then, the question becomes: are we willing to do the hard work necessary to exchange our imperfection for the perfection initiated by Him? 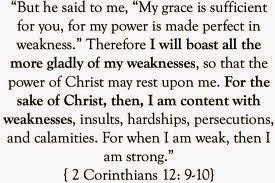 Paul had an unspecified weakness. Yet, he gloried in that frailty because it allowed God to mold him into a man of unbelievable power and faith. Paul could have remained one of the top Pharisees who persecuted Christians, but God had plans to enable Paul to change the world for millennia. God couldn’t leave Paul alone because Paul had missions to fulfill. God has plans for us, too. 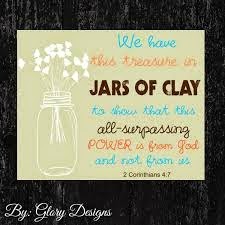 He works with us--the imperfect, cracked jars of clay-- in order to show forth His power. If we believed we were “perfect” as we are, He would be blocked from changing us into the amazing people we were meant to be. We must remain pliable in His hands. 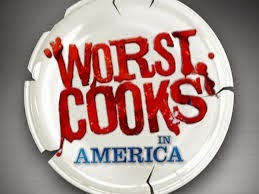 I watch every episode of this Food Network Channel reality series. One of the reasons I enjoy it so much is the empowering examples of victory. People from all walks of life, who rarely use an oven or stove, often make restaurant-quality meals as the season progresses. They are prime examples of determination. They learn from their mistakes. They transform limited kitchen learning into the knowledge of a professional chef. In the most recent episode, Sarah was assigned to make angel hair pasta. She messed up the first time. She put in too many eggs. Her pasta was gooey and yellow. However, she worked with that same pasta, adding ingredients until it reached perfection. In the end, the only complaint chef Tyler Florence had was that her pasta was too thin. 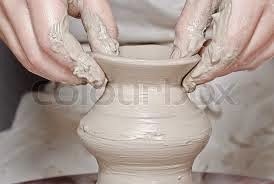 Sarah was the “master potter” of the angel hair pasta in the same manner as God is our potter. We’re all imperfect; but, we aren’t meant to stay in imperfection. Growth often hurts; yet, it is a necessary fact of life. Only God can see the end. Only He knows how we need to transform, and the best route to that transformation. Hello Traci. I believe we are all perfect Children of God (without exception). However, we have covered up our perfection with veils of imperfection. It is up to us, with God's help, to lift the veils of imperfection and discover who we really are. Hi, Don. Thanks for your brilliant, self-empowering thought! We are all perfect inside; but, mistakes and "failures" can cover that up.